Odd Squad is the latest PBS kids show run by kid detectives that investigate weird phenomena and incorporates math concepts for kids 5-8 years olds. You can catch Odd Squad at 7am every weekday morning on PBS Kids, KQED Channel 9 in the Bay Area. I was fortunate to catch up with co-creator, Tim McKeon, to talk about his new series. What were your favorite childhood shows? The show I really loved was “The Adventures of Pete and Pete" on Nickelodeon. It’s weird with a lot of great heart to it. I also loved how silly “You Can’t Do That on Television” was. My co-creator, Adam, and are fans of the Airplane movies, Naked Gun, and The Jerk. We realized that there are few smart, funny, comedies with weird and absurd stuff for kids. That was the tone we wanted. Did you always want to write for children’s television? I grew up in Massachusetts and went to U Mass Amherst. I started in high school acting and writing in plays and loved doing that. I quickly realized I wasn’t a great actor and steered towards writing. Then I thought, how am I going to make a living and I heard about people making a living writing for television. I moved to Los Angeles and I didn’t set out with the idea to write for kids, I fell into it. I love it, it’s fantastic. You develop “super fans” who recreate entire scenes in Youtube. Kids get so invested and interested. Your co-creator, Adam Peltzman, was the lead writer for "Blue's Clues,' “Backyardigans” and creator of “Wallykazam” and you were a writer for "Gravity Falls" and "Adventure Time.” How did you meet and decide to collaborate on a kids series? We went to a tiny high school together in Massachusetts but we didn’t know each other. I was a freshman when Adam was the super cool senior. We lost touch and eight years later we met up at a friends wedding. Adam was writing for kids TV in New York and I was writing for kids TV in Los Angeles. We kept in touch and collaborated on each others projects when we both individually received a call from PBS saying they were looking for a kids math show and asked us to pitch ideas. Since Adam and I like working together we decided to team up and create a show. 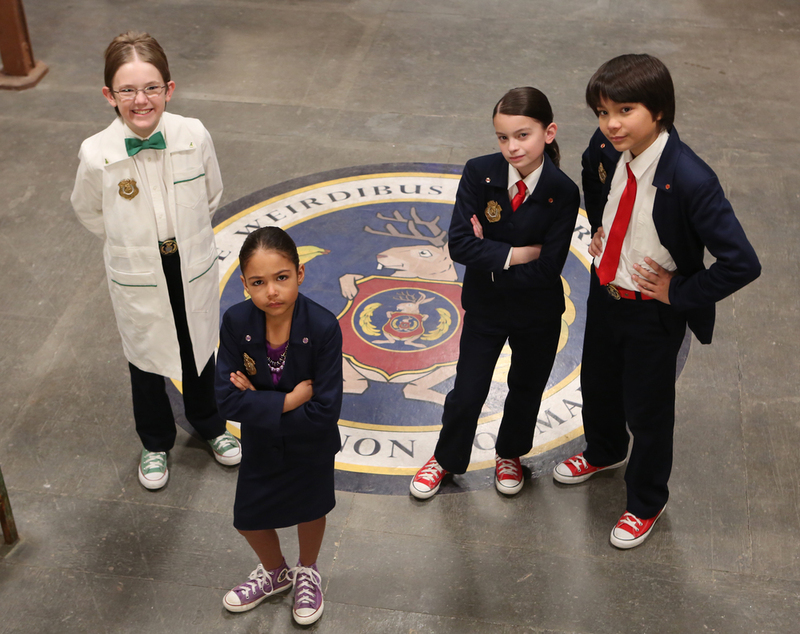 What was the pitch you gave to PBS for Odd Squad? Every episode something odd happens. For instance, there’s an episode with a slimy one-gallon blob that’s loose in the headquarters and the kids are trying to catch it, but, they're capturing parts of it so they have to measure how much they have verse how much is still left. It’s a sneaky way to teach measurement. Adam and I were english majors and we didn’t think about math that much. I was never amazing at math but I’ve become very passionate about math. I feel there's a lot of adults and kids that say math is boring and I really disagree. I think there are boring ways to talk about math but there's funny interesting character driven ways too. Odd Squad tells a funny story, that's action packed and teaches math concepts. Before this, I hadn’t worked on educational shows but it’s a bonus. What’s better then telling an hilarious story and also teaching. I noticed the tube system detectives travel to get to Odd Squad Headquarters. One thing that was really important is to tap into the wish fulfillment that the Harry Potter films do. If you took just the right turn or knew where to go you could find the secret tube entrance and get to the Odd Squad headquarters. In the show we say there are Odd Squad branches all over the world and our website encourages kids to join Odd Squad because we need them. The stories we are telling create this whole fun world where the kids are in charge and the adults are the ones who have a problem. It's a kid run world and our audience really responds to that. It’s really fun. What are some challenges to working on a kids show? Our hope is to make it legitimately funny for kids but also have jokes that parents appreciate. We didn’t want to create a show that talked down to kids, it’s the way we work too. We have a directors guide in big bold letters that says “Treat the kids like equals." One thing that isn't a challenge is how much the kids can handle. They blow me away every day. For example, we've given the 8-year-old girl who plays Ms. O page-long monologues and she's nailed them in one take. It’s been really fun talking with the kid actors about their character and coming up with some ad libs. When we are on the floor and a joke doesn’t work, we huddle up with the actors and they have really great ideas. The practical challenge is that they are kids and they can only work for so long. When we are shooting segments, we group scenes out of order. So we might shoot all the scenes in six episodes that are at the lemonade stand. It’s testament to the kids to remember the stories, keep their lines in their head, and which scene came before. I’ll always be a writer in my heart but I directed a bunch of episodes and that was a blast. It’s a collaboration on every show. The goal is to have as much of a shared brain as possible. It’s really empowering working with the different departments. The scripts are really a blue print and all ideas are welcome. I’ll take a good idea from anywhere. And it's been fun seeing the different ways stories and characters get developed. When we built our set we had an extra room. One of the exec producers on the show and the series director, J.J. Johnson, said, “We should build a medical room.” At the time I thought, “We don’t have a doctor character.” He said, “Ah you’ll figure it out.” So they built this great medical room and three weeks later he said “You gotta use that medical room.” Then we created the character Dr. O and she’s fantastic and one of my favorite characters. She’s like Leslie Nelson, straight-faced and barking doctors orders. So, in this case the set created the character and story. Tell me more about your cast. We really focused on girls in a leadership position and a diverse cast was important to PBS and us. We try to play it real and straight because then the oddness pops more. The fact that these kids aren’t reacting to all this crazy stuff happening around them makes it funnier. Kids grow really fast. If the television show is successful, what are your plans in the future? It’s called Odd Squad so it’s not about an individual character. There’s that built in possibility for it to go on because there are always new agents and new stories to tell. But I do love the kids we have now. They come up with little details that make the show. When we first wrote the script, the agents had badge phones that they talk into with them answering “Hello.” But the girl who plays Agent Olive said “I feel like my character would say something different.” So she came up with “Go for Olive” and her partner, Agent Otto, says “O-T-T-O”. Now all the agents answer their phone in their own unique way and it just enriches the show. I really love these fun details. The kids will also catch you if there is an inconsistency. They’re the stewards of the whole show. I read in an article you wrote that kids are better to work with then adults. Why are kids are better than adults? Kids are fearless. Kids don’t have all those walls to protect themselves. One of the fun parts has been adjusting characters based on awesome kids you find. Kids are so much fun and have so much energy and joy, if you can capture a small part of that it’s gold. Are there any special cameo appearances? We have an episode with Kevin McDonald, Mark McKinney and Scott Thompson from Kids in the Hall called "Crime at Shapely Manor” which is like the movie Clue. We're in Toronto, there’s The Second City here and all these great actors, and stand up comedians. If you get an hilarious actor next to the kids, the kids are funnier too. We’re open to using guest stars but funny trumps everything. What do you hope kids retain from the show. The dream is that the kids watch the show because they enjoy it and connect with the stories. The hope is when a kid hits that moment in a math class and they remember something from the show that helps them. Or when the teacher is teaching them about one of the math concepts we talked about in our show and they realize, "hey, I already know this." Are you coming up with the math concepts from the Common Core Standards? When we first started, PBS provided us with this massive (and intimidating) spreadsheet that has all the curriculum areas they want us to cover. It’s very specific. We have to do an episode about estimation, rounding, and learning to read an analog clock. We have an educational advisor who was a former first grade teacher, plus PhD's on our advisory board whom we run the scripts by. You have the security of knowing that there's so much research that has gone into what you are teaching. If you were a member of the Odd Squad what agent would you be? I would like to think I am Agent Olive because she’s always in control and the smartest, but, in reality, I’d be more like Agent Octavia who is a bit of mess and can't keep her stuff together. I wish I had the dance skills that Otto does. On the set everyone said I’m the most like Agent Oscar, the scientist. Now that your show has been released, what do kids think of it? We did some early testing and the feedback from kids has been great. I love hearing that kids like the show and want to watch it. Now we hear more from parents. My favorite comments are, “Thank you for making a show I want to watch with my kid." It’s fun hearing people quote lines from show. Can you tell me about the jackalope logo? It’s modeled like the official seal of the FBI and no one claimed the jackalope. At the end of each Odd Squad half hour there’s a 30 second jackalope cartoon. Mike Chapman from Home Star Runner does the animation. The show is a blast to work on. I've been working on the show for three years and we've been filming for over a year. It’s so fun now that it is out, people are reacting to it and sharing what we’ve been working on for so long.